I cannot believe it’s been two months since I saw my friend, Annelies, in Portland for her amazing Steeped cookbook cooking class at Smith Tea. Annelies and I met a few years ago at a blogging gathering in California, have shared a meal together, and just blended well. So when she invited me to her cookbook class, I was beyond excited to see her, and so proud to call her a friend. She has done an amazing thing here. She wrote a cookbook around tea, incorporating it into recipe with love and ease. In unexpected, creative ways, it is easy to follow along her journey into this incredibly diverse herb. That is one good way to approach using tea to cook. 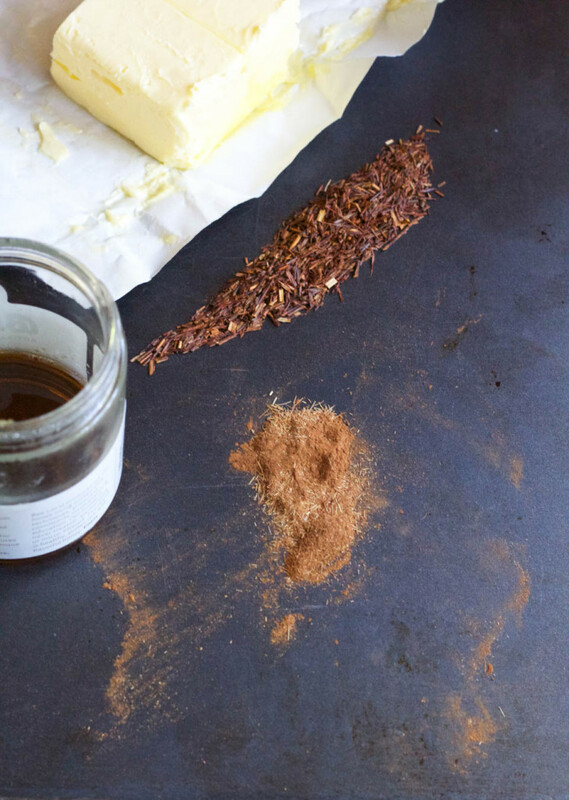 Think herbs, and spices to add flavor to the most simple things, like butter! When I ate this butter, I wanted to sit down on the floor from butter bliss. The flavor is surprising in the best of ways. It’s sweet, savory, luscious, and creamy, all good things. There are many recipes I enjoyed that day with my friend that she fed us, which was glorious. For some reason I really took this butter. It seemed so easy to make, and keep in the fridge for a few days to enjoy on my morning toast, a special treat. 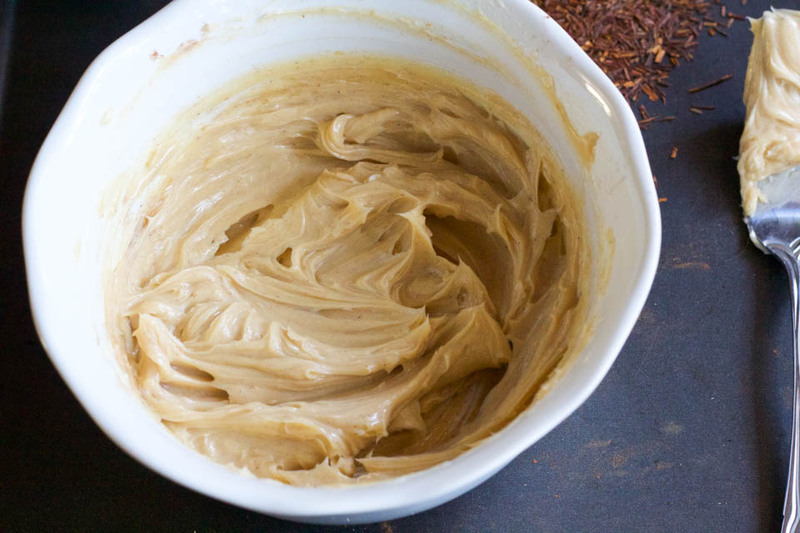 Unlike most compound butters that can be overwhelming in flavors, this one is bold yet subtle. Rooibos is one of my favorite teas, and it loves butter, and maybe that’s why I love it. This is the perfect way to begin a journey into using tea in cooking if you have never gone that path before. 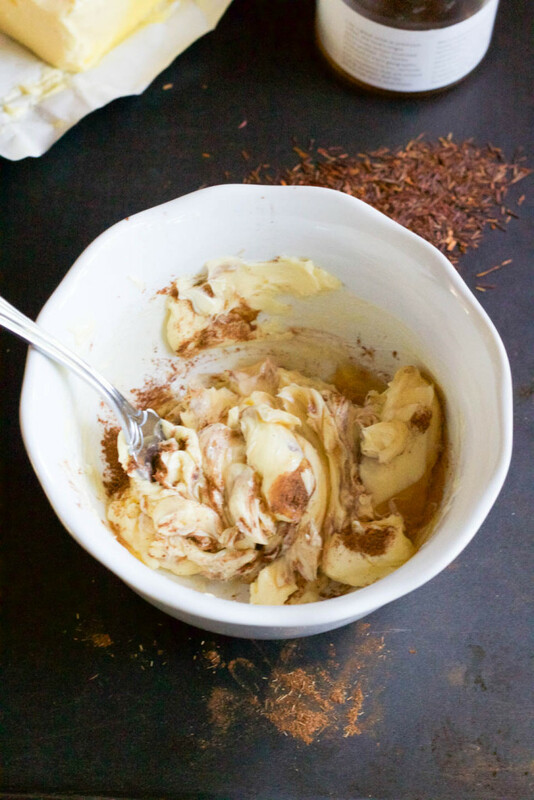 From the book: This rooibos honey butter melts into terra-cotta pools of sweetness on warm scones. 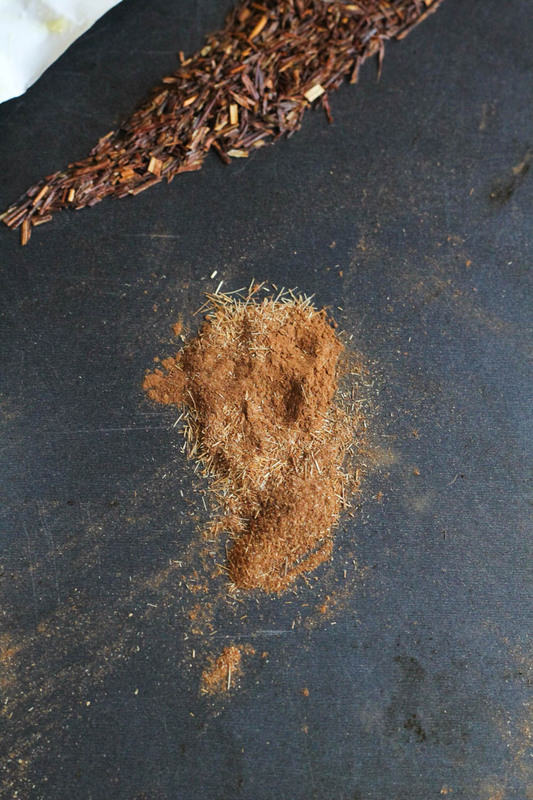 Pulverize the rooibos leaves with a spice grinder, or cut open a bag of Republic of Tea’s Organic Double Red Rooibos. TO MAKE THE BUTTER: In a small bowl, stir the butter, finely ground rooibos, and honey until combined and the color of the dust on Mars. Use at room temperature or refrigerate until use (for pats, roll the butter into a log in a sheet of parchment paper and chill until hard). I used it on toast, cheese plates with baguettes, scones, tea time, and pretty much right out of the bowl. It’s that addicting and good. Other awesome posts about Annelies’s cookbook! Fun!! I love the Vanilla Rooibos from Coffee Bean & Tea Leaf. Seems like that might work really well here too. For sure it would work! Annelies is the best and I’m so excited about her cookbook! Beautiful job with the butter! Isn’t she, I adore her. Thank you! This sound delicious! I can imagine it would be great on French toast or a simple biscuit! This sounds delicious! I can imagine it on French toast or a simple biscuit! Oh French toast, great idea! 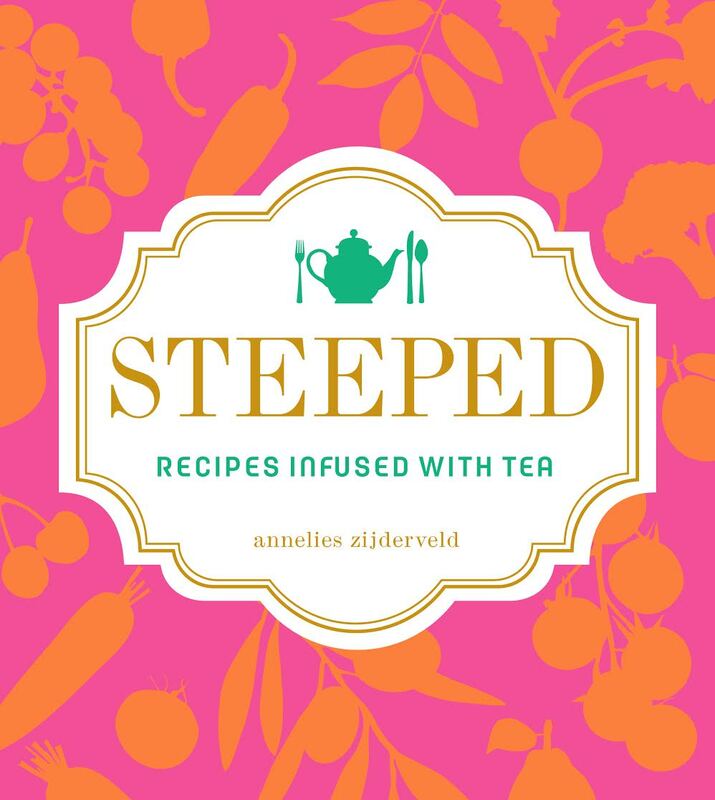 I’ve heard so much about this cookbook – what a fun concept making all recipes infused with tea. 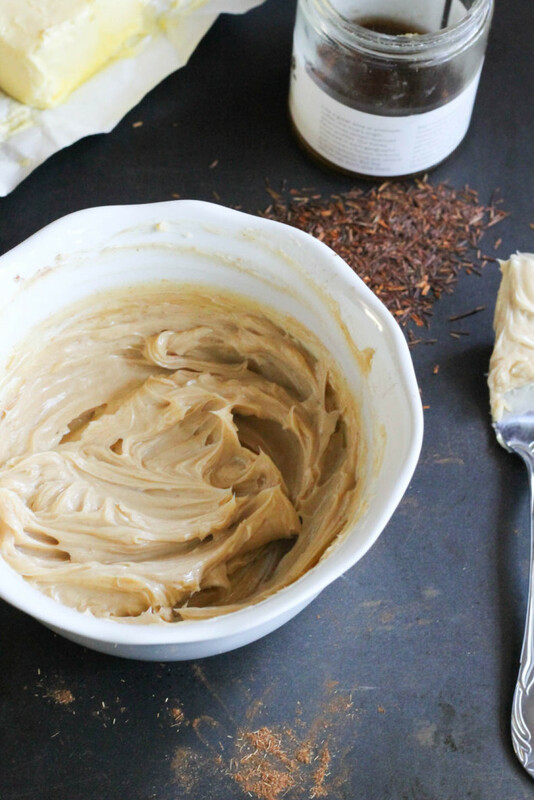 This honey butter sounds heavenly! It really is a unique and approachable different cookbook. I love it! I make tea everyday! This is a great idea! You’d love that book if you drink tea everyday! This looks so divine. I need to check out this book – I love infusing random things with tea. I love honey…I love rooibos…awesome idea to combine the two! Such a great combo and book! Thank you so much Fabi for getting steeped and sharing about my book. I remember you mentioned you liked this butter at the cooking with tea gathering and am thrilled you love it! I had kind of an obsession that day, tried not to eat all of the bread with butter in front of my colleagues :). It’s such a simple thing, flavored butter. But I had never had a butter like that, it has a place in my fridge most all of the time now. It’s no surprise, I like the simple things in life, like butter. Isn’t it the coolest? We had a tea furukake on popcorn, tea panna cotta, and the book blows my mind with all of the creativity. She rocks!